A few years ago, State Representative Ed Thompson, was responsible for letting the Pearland Athletic Department know that the player that scored the first touchdown in Pearland High School football history in 1937 was still alive and was one of his State Farm clients. David Scott passed away on Wednesday, May 13, 2015 as the oldest living Pearlander at the age of 95. Now he has finally joined his wife after being apart 11 years. Scott’s wife died on February 4, 2004. “We were married 60 years and 19 days,” Scott said as he remembered the wonderful years they shared in that interview. In a past interview, Mr. Scott was very proud to be from Pearland. Several years ago, he was presented with a small badge for all to see that read, David Scott. “Mr. Pearland”. That badge also gave him a lifetime ticket to attend any Pearland High School sporting event in which he was a die-hard fan. Pearland High School opened in 1936 and understandably didn’t have a football team that first year. However, the Oilers fielded a team in 1937, but they had only one game on their schedule — and that was against La Marque who was not known as a state power at that time. The Oilers defeated the Cougars 7-0 in the only game of the season for Pearland. A junior quarterback by the name of David Scott, not only scored the first touchdown in Pearland football history, he also booted the extra point. That was the only game Scott ever played for the Oilers as Pearland didn’t have a team in 1938. “I was the only quarterback in Pearland history who finished his career without losing a game,” Scott laughingly joked. Pearland only had 13 players on the team for that one game in 1937. 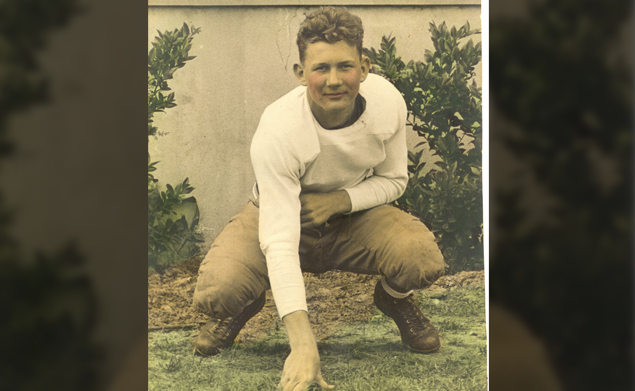 While Scott scored the first touchdown in Pearland football history — he was also known as the oldest living male who was actually born in Pearland. “I was born on January 16, 1920 on Hickory Slow,” Scott said. “He was close to an area off Mykawa and Scott Lane.” “Dr. Long came to the house to deliver the baby and I was that baby,” Scott said with a sly grin. Scott recalled different early jobs he had including working in the hayfield. He joined the National Guard and was a member of the 56th Calvary Brigade that was called into action by U.S. President Franklin Delano Roosevelt during World War II. Scott served his country from 1940 until he was discharged on December 13, 1945. While he was serving his country, Scott met a beautiful nurse named Anna while he was in the hospital. They only knew each other for a short time and were married 36 days later on January 21, 1944. The couple had two girls, Rachal and Karan, who gave Scott and his wife three grandsons and ultimately five great-grandchildren. Scott proudly served the Pearland Volunteer Fire Department for over 27 years and is the last member of that original department. He is a charter member of the PVFD, the Lion’s Club and the local VFW. David Scott had a very sharp mind and recalled the very early history of Pearland. He was proud to be from Pearland and maintained his friendship with two other outstanding athletes in the early days — Mickey Mark, who played for Pearland in the late 40’s and Luther Cunningham, who played on the 1948-1950 teams. 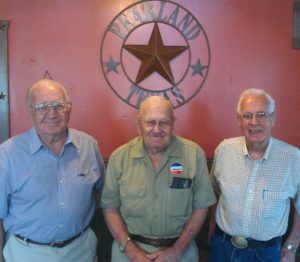 The trio, though a few years apart, are a wealth of information in keeping the history of Pearland alive. While Pearland is one of the fastest growing cities in the Houston area — a community should never forget their early roots and the people who helped establish those early days.